Beijing, China – All eyes were on Singapore in June last year as a jumbo jet carrying Kim Jong Unlanded on the tarmac of the city-state’s Changi airport, days before the North Korean leader’s landmark summit with US President Donald Trump. As Kim took his first steps onto Singaporean soil, having completed his longest trip abroad as head of state, those watching noted that he hadn’t disembarked from a North Korean airline – but a Chinese one. Beijing’s loan of the Air China 747 carrier made logistical sense. It provided Kim with a far more reliable mode of transport for the 4,800km trip to Singapore than his own decades-old official aircraft. The move was symbolic besides being practical. Although China – North Korea‘s main ally – was not physically present at the Singapore meeting aimed at reviving stalled nuclear talks, it played a key role. “China’s blessing is important for North Korea,” Tong Zhao, a nuclear policy fellow at the Beijing-based Carnegie-Tsinghua Centre for Global Policy, told Al Jazeera. Without Chinese support, he added, Pyongyang may fear being “strong-armed into an unfair deal”. And now, with another summit between the United States and North Korea set to take place at the end of this month in Vietnam, Beijing has been just as influential. “China does not want to be pushed aside by the Trump-Kim summit; it wants to have a role in shaping it,” Carlyle Thayer, a security consultant and emeritus professor at The University of New South Wales in Australia said. 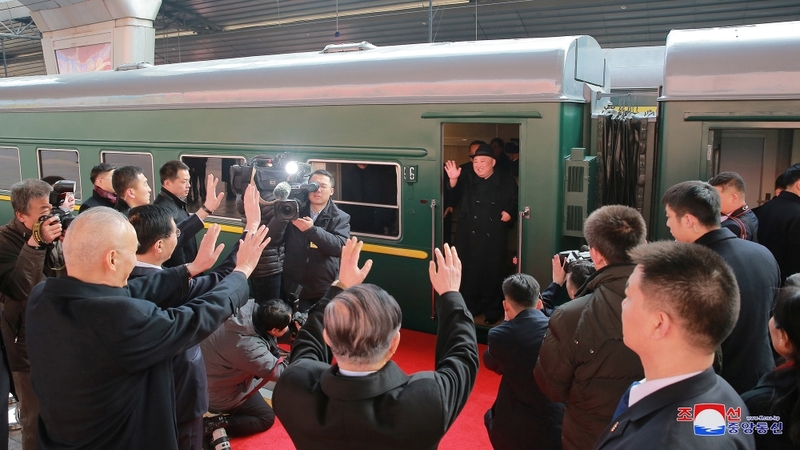 When Kim arrived in Beijing on a bulletproof train at the invitation of Chinese President Xi Jinping last month, speculation over a second, upcoming meeting with Trump was mounting. The trip marked the once-reclusive North Korean leader’s fourth summit with Xi in the past year, including his first-known diplomatic foray overseas with a visit to the Chinese capital in March 2018, all of which came before and after talks with either Trump or the South Korean President Moon Jae-in. China is North Korea’s largest economic trading partner. Beijing’s support for Pyongyang dates back to the Korean War (1950-1953) when Chinese troops were sent to the Korean Peninsula to aid the North’s forces. Former Chinese leader Mao Zedong once described the relationship between the two countries as “close as lips and teeth”. But these brotherly ties began to deteriorate when North Korea began testing its missiles in 2006, before hitting further lows in 2017 after Pyongyang began ramping up its nuclear tests. “China was very irritated when Kim was firing his ballistic missiles and setting off explosions,” Thayer said. “It brought threats from Trump as trade issues were rising,” he added, referring to a major tariff dispute between the world’s two largest economies. According to Zhao, China’s renewed closeness with North Korea does not stem from “mutual trust” but from “mutual benefit”. He said China’s ultimate goal was denuclearisation on the Korean Peninsula while maintaining its influence on the region. Cheng Xiaohe, a professor of Korean studies at China’s Renmin University, said Beijing supported the Trump-Kim summit because it saw it as a crucial step towards stability in the region. “Nuclear issues have been bothering the whole of Northeast Asia,” Cheng told Al Jazeera, adding that China believed a positive outcome would help transform North Korea from “a country that used to be the origin of tensions and wars, to one that’s stable and peaceful”. Pyongyang, in turn, sees close ties with Beijing as crucial to its economic development. Chinese support also gives Kim a certain amount of leverage as he negotiates the lifting of international sanctions. Though China began imposing United Nations sanctions on North Korea in 2017, it has been careful to maintain an economic lifeline for North Korea. Beijing remains the country’s main source of food and energy. Therefore, he added, promoting dialogue with the US and interaction with other countries was, “in the long run, good news for China”. When Kim and Trump met on June 12, 2018, in what was the first encounter between a North Korean leader and a sitting US president, millions of people around the world stopped to watch the two leaders’ historic handshake. Only months before, such a moment seemed unthinkable – North Korea had intensified its nuclear testing, prompting the US president to threaten to rain down “fire and fury”. But although the Singapore meeting was visually spectacular, it contained few details, resulting in little tangible progress on the denuclearisation process. This time, Cheng said, China would want more concrete results and both countries to reach “a real consensus” during the February 27-28 summit in Hanoi. “For example, for North Korea to agree to international monitors checking and reporting on its nuclear weapons and facilities; and for the US to agree to partially lift sanctions,” said Cheng. Failing that, he said Beijing would welcome “lower” or “medium-level” goals, such as the halting of weapons development and the dismantling of the Yongbyon nuclear facility, increased economic cooperation with South Korea and an official end to the Korean War.